The Proof Gold American Eagle is the collectible version of the American Gold Eagle Coin. It is one of the few collectible coins allowed in an Individual Retirement Account. Due to their numismatic importance and limited supply, Proof Gold American Eagle Coins carry both collectible and scarcity value in addition to bullion value. “Proof” refers to a specialized minting process that makes this coin appear more glistening and detailed than regular bullion coins. Proof coins are bought and sold with much higher premiums than regular bullion coins because they carry both collectible and bullion coin value. Currently Proof American Eagle Coins are the only proof products allowed by the IRS to be put in self-directed IRAs. Proof Gold American Eagle Coins are available in 1-oz., 1/2-oz., 1/4-oz., and 1/10-oz. denominations. 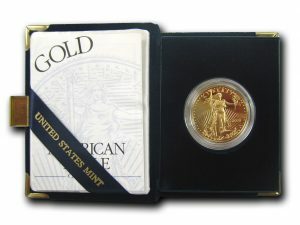 Purchasers may buy Proof Gold American Eagle Coins in any variety of these sizes individually or in sets of 2 or 4 pieces. Obverse: Features the iconic Striding Liberty design by the sculptor Augustus Saint-Gaudens. Reverse: A nest of American eagles symbolizing the American family. Designed by Miley Busiek. Proof Gold American Eagles are one of the most recognized and desired coins in the world. As members of the American Eagle family of coins, they are highly liquid and easy to buy and sell. The United States government guarantees the coin’s gold content, weight, and purity. Each Proof Gold American Eagle Coin comes in an attractive presentation case with an official U.S. Mint Certificate of Authenticity. 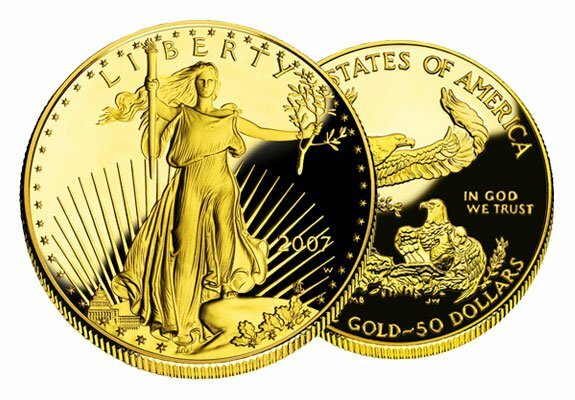 If you would like to purchase Proof Gold American Eagle Coins or add them to a Gold IRA, contact American Bullion at 1-800-326-9598 and speak with a precious metals specialist. For more information about proof coins, visit our proof gold and silver page.